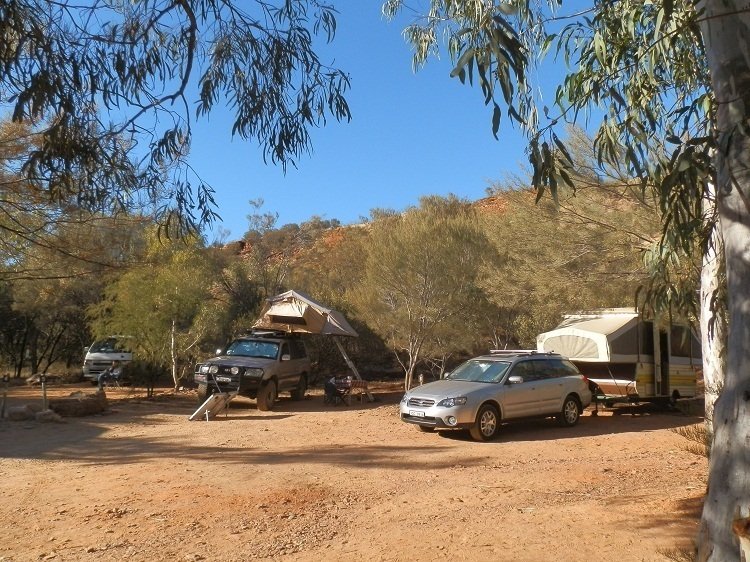 For a good time, spend a few nights at Central Australia’s Ormiston Gorge and surrounds – like we did for 6 fun-filled days (and nights) in June 2012! 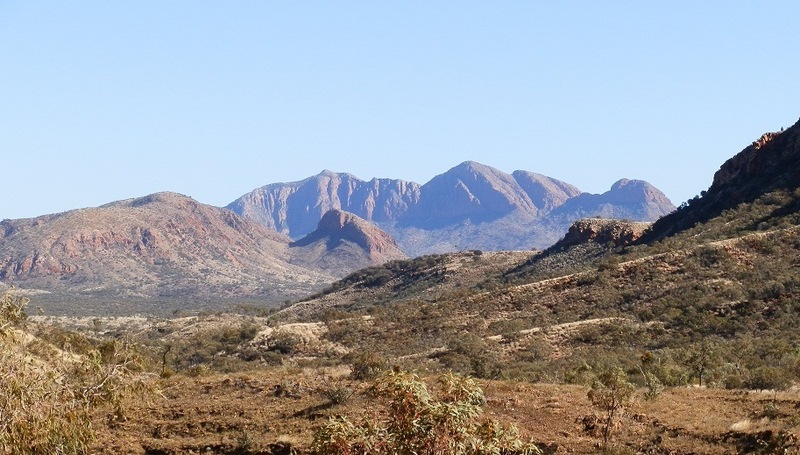 A geographer’s fantasy, the long line of Central Australia’s Western MacDonnell Ranges stretches out across the desert plains from Alice Springs full of spectacular scenery, gorges, rivers, mountains and rock formations. 135 km west of Alice Springs, Ormiston Gorge’s 300 metre (985 feet) walls tower above Ormiston Creek. The doubled-over double layer of quartzite folded into itself has made the gorge’s walls significantly higher than those of the other gorges in the region, and its location in the surrounding ranges means superb panoramas, wonderful walks and a marvellous base from which to experience the region. Here’s my guide to 7 FAAABULOUS experiences to have within a 10km radius of Ormiston Gorge! ‘Oh, you’ve missed the sunrise,’ she said, smirking with a particularly smug condescension that almost – but not quite – masked the unfortunate inanity of her claim. Wouldn’t I have noticed if I’d been climbing the steep, narrow and rocky track to the lookout in the total darkness of the pre-dawn night? No, the sun-drenched landscape was a dead give-away. I clearly HADN’T missed the sunrise! Secure in the superiority that one-upmanship brings to the uninformed, the couple descended into the chill of the Gorge, hung about with the several thousand dollars worth of photography paraphernalia that would prove their sunrise claims and show off their ‘serious traveller’ credentials. Unused to such mindless competitiveness before breakfast, I got out my trusty single lens/single SD card/single battery/no tripod camera. As the ALREADY RISEN sun continued to ascend, the chill of the cold Central Australian desert night wore off. I wondered if the Camp Bore had left yet. The previous night, after setting everyone straight about a number of diverse topics at the communal Barbecue area, he’d inadvertently ‘entertained’ everyone in the campground with a DVD on ‘Super-loud’ setting presumably to counteract his deafness. And early this morning, he’d regaled a fellow camper who’d foolishly admitted to not hearing the dingos the previous night with a howling dingo impersonation. Then way down in the gorge beneath us, I sensed a movement. After the Camp Bore’s strangled yodelling (sadly not literal) it was quite a surprise to see the dingo moving so quietly and surely along the water’s edge. No, really. Every year as the waterhole dries out, more and more fish compete for less and less oxygen in the shrinking pools. Then along comes a dingo in search of some easy pickings and scoops them out! We may have ‘missed the sunrise’. But in a superb combination of poetic natural justice AND childish satisfaction (that gave my inner child a sadistic shiver of glee) WE saw the dingo. Part of the fun of this extraordinary ~7km loop trail through a cross-section of Ormiston Gorge’s scenic highlights is the possibility of swimming or wading through the ice-cold water of Ormiston Creek towards the end of the trail. But don’t let this – or anything else – stop you from attempting this 3-4 hour hike. In my opinion, even though we didn’t spot the Spinifex Pigeon family that EVERYONE ELSE saw, it’s one of the best medium length walks in the country! If this teaser pic isn’t enough, click HERE to see what happened when WE did the walk! Spectacular though it is, the Ormiston Gorge and Pound walk is a mere detour on the 223 kilometre/12 section hike along the West MacDonnell ranges that forms the demanding Larapinta Trail. Difficult terrain, extreme weather and remote location mean it’s not for the faint-hearted – or under-prepared. 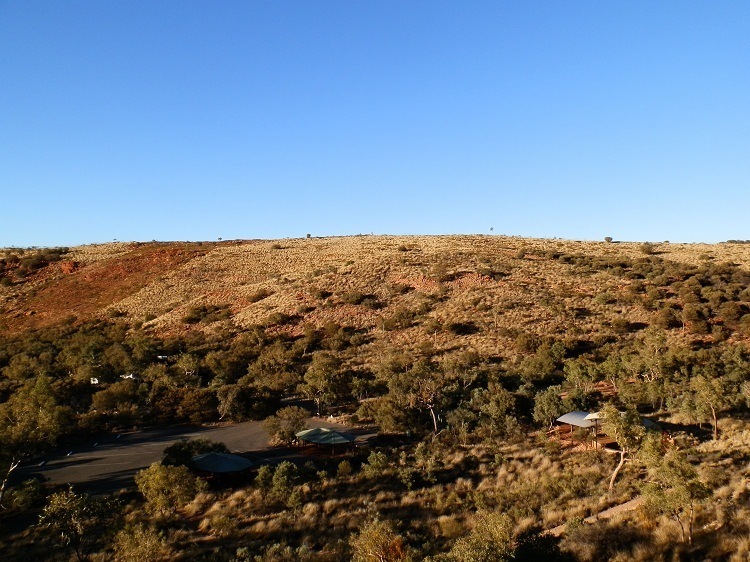 But lack of training, portable camping equipment or energy needn’t prevent a ‘Larapinta Lite’ experience! 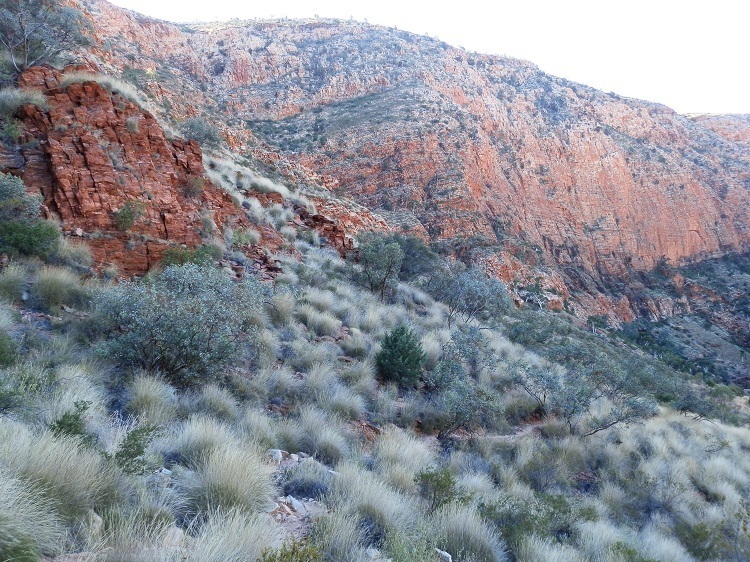 A segment of an official section of the trail connects Ormiston Gorge with Glen Helen Gorge, a few kilometres away by road, and is quite probably one of the easier sections of the trail to attempt. 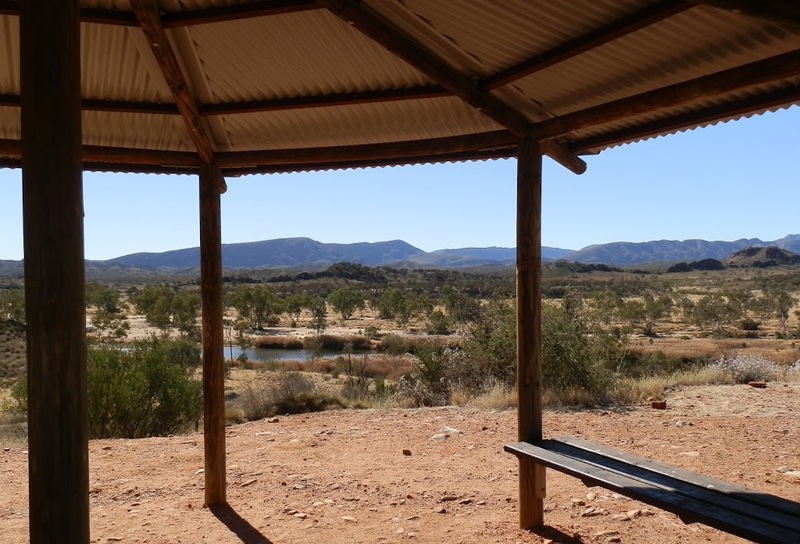 We ventured a few kilometres down this part of the track past staggering views of Mt Sonder and the Pound to a lookout point with the stunning red cliffs of Glen Helen gorge in the distance. After a fruitless search for Rufous Crowned Emu Wren, we returned the way we’d come vowing that next time we’d organise a pick up at Glen Helen Resort and walk all the way. BUT … far more importantly, now I can add the Larapinta Trail to the list of walks I’ve ‘attempted’! Because no one takes my list seriously anyway! In a region so crowded with spectacular gorges, time-pressed travellers wishing to avoid the risk of become ‘all gorged out’ can be tempted to bypass a couple of them! But skipping Glen Helen Gorge would be a mistake. Not just because of the spectacular Gorge itself, either. The Glen Helen Resort offers meals and accommodation, as well as tours, helicopter flights, fuel and gas. As well as a well stocked bar. And you can’t have too much RED Rock, right?? There’s more about Glen Helen Gorge HERE! Mt Sonder isn’t the Northern Territory’s highest mountain – that honour goes to Mt Zeil – but it’s (arguably) the most picturesque! And as a real Larapinta trekker told us after climbing the mountain on the previous day’s hike – ‘it’s a better view OF than FROM’! Although there’s something about its Namatjira-esque blue folds that draws one towards it, we (fairly easily) resisted the impulse to climb it and instead opted for the Mt Sonder Lookout a short distance west of Glen Helen. Although it’s a fine view in its own right, looking across the ancient bed of what is known as the world’s oldest river – the Finke – is an added bonus. Call it coincidence, but the collection of campers coming and going at the Ormiston Gorge campground during our 6-night stay in June 2012 would have defied any B-grade movie casting director to create a better ensemble. So much so that hanging out at camp was as entertaining as anything else the gorge had to offer. I guess you know you’re getting older when just listening to the young couple 6 months into a year travelling Australia gives you a whole new perspective on young-love-speak. Sure, the “’Hi Baby’/’Hey sweetie!’” combo wasn’t that unfamiliar – but after spending only 5 minutes apart?? Then the dialogue as they prepared to leave. ‘Hey sweetie, have you packed the bedding?’ ‘Sure, babe.’ ‘There just seems more room than usual.’ ‘Well, maybe I just folded them differently.’ ‘You must have packed them in a particularly awesome kinda way!’ ‘Yeah sweetie.’ ‘So do you fold them up, honey?’ ‘No, I just throw them in, babe.’ ‘I’m flabbergasted!’ ‘Hey, why don’t we make X’s favourite meal when we catch up?’ ‘Babe, that’s a GOLDEN idea!’ Education and entertainment all in one, we were sorry to see them go. But replacing them was Broken Hill artist, Eric McCormick whose vibrant works beautifully capture the magic of the desert. Eric took our breath away with a catalogue of his works inspired by a visit to Spain’s Rio Tinto and we enjoyed several entertaining chats over the communal barbecue. Then there was the couple with such a faulty sense of direction that in trying to find the Gorge and Pound walk they’d ended up somewhere else altogether. 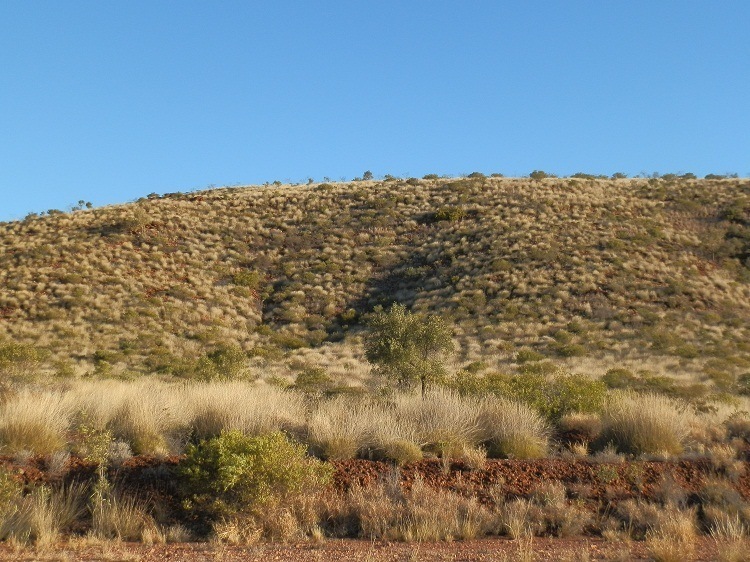 We tried to explain how to access the Larapinta segment we’d done, but they couldn’t find it. I wonder whether they even knew they were at Ormiston Gorge?? With hot showers and free barbecues, the $10 per night per person rate seemed quite reasonable for a site within cooee of the gorge and all its attractions. But the camp hosts still spent a good part of their day in a losing battle to keep the freeloaders from hogging the amenities the rest of us had paid for. In a vain attempt to keep the solar-heated hot water for those who’d paid for it, the showers were locked from 10am – 4pm each day. Is it something in the air? Or water?? Or does this strange and magical place attract the quirky, off-beat and downright bizarre? And if so, what does that make US???? The Ghost Gum Lookout is part of a longer loop walk along the Gorge’s western wall, descending into the gorge and returning by rock-hopping along the creek bed. Whether or not you attempt the whole loop, it’s well worth reaching the lookout in the very late afternoon. Because looking across the gorge from the lookout is very different to the sunrise ALREADY RISEN SUN view as the setting sun lights up the Eastern wall. But … far down the gorge and deep in the silence of sunset, the dingo lurked again! « 12 Coastal Photo Clichés from around Australia! Ormiston Gorge seems so picturesque and stunning. I would love to go hiking there. When’s the best time of the year to do so? It’s a great place to hike, Agness – the best time to go is during the cooler months from May to September. The Aussie winter is from June to August, but while nights can be cold in Central Australia, daytime temperatures are usually pleasant and mild. Hot day time temperatures can be experienced any time outside winter, but try to avoid the summer months of December to February! @Iris – Oh, that’s a LOOOOOONG time!!! Sounds like your best bet is to get Ingo to play the game – maybe you could show him my blog so he realises it is his DUTY to play – and WIN! Good luck!! Or until I win the lottery (which´d mean I must play the lottery, which I don´t). Wow, brilliant post Red, exactly the right length to finish a cuppa tea! Seems to me every ‘group’ situation is allocated a ‘camp bore’! In a small way they can be entertaining in their ability to get people talking. Absolutely love the dingo pictures, did not know they ate fish.. Seeing your images and knowing you don’t have a fancy big camera always reaffirms my belief in the skill of the photographer not the equipment they use. @Sallie – At least I can look back and laugh at the Camp Bore!! AND pay him back by writing about him with the sure knowledge that even if he DOES stumble across my blog, he won’t recognise himself! @FruitCake – Yep, these folks sure had a bad case of the ‘thingies’!!!! @Jill – Hahaha, every trip there’s at least one BAD night!! Ours was at Timber Creek where some drunken loser in a van next to us simultaneously played Elvis on his car stereo and Redgum in the van. But I think I’d almost rather him than your student group!!! @Greg – I look forward to seeing what fiascos emerge from your Larapinta experience. As for National Backhander Day, I think it’d work as an election platform!!!! @Andrew – Spam gone now! And sadly, there IS an honesty box!!!! I guess not paying for a shower frees up your cash for other essentials like alcohol!! @LONDONLULU – Yeah, I know! But it’s nice to have the affirmation!! @darlin – The first trip anywhere is often just a reconnaisance trip! It was for us, and now after several years, we returned to ‘do’ it properly! @Iris – I’m sure there IS a story behind the piano – but I don’t know what it is! You’ll have to find out for me!! And that’s why I’m here – lots of guidebooks focus on the big attractions (because that’s what most people want to see). I just tell you where I’ve been and what I liked & you can decide for yourself if you want to see it! Now we’re talking! Thanks for a heads up to that area, as hopefully I’ll be on the Larapinta Trail in a months time. we travelled through the West McDonalds a couple of years ago. Such spectacular scenery. I am looking forward to going back again one day when we have more time. I have not so fond memories of a Uni groups last night of their 2week study trip at Glen Helen campsite….not much sleep that night! Fabulous pics as always Red! Obviously people can be thingy about sunsets. Some people are just thingy about anything. And some people… well, some people are just thingies. Could do without the camp bore (there’s always one of those wherever you go) but the communal bonfire in the campground sounds really pretty cool. Gorgeous hikes. It sure is a unique landscape and seems to attract unique sight see-ers. I can’t believe the freeloaders story. That is so so so crass. Your shots are enthralling. Really, Dingos go for fish?! Is there a story behind that piano with all those shoes? Yep, so sad some travellers misuse reasonalble-priced offers of solar showers. Can´t remember where that was, they were de-installed due to misuse. People really threw rocks from the lookout?! Sad you need a sign like that! Awww, really, we were in no hurry back then in 1999, we just didn´t KNOW about those places! The “lonely Planet” was not the help it should´ve been. How do you find out about all those beautiful places? I was so close to this area and never had a clue about it… next time! I couldn’t have spent the week or so to take it all in as I was there doing my placement, next time it’s going to be sheer pleasure and now I know about this it’s going on my “must see” list. Have a wonderful week Red, cheers. Wow – Times 7!!! I feel utterly claustrophobic lately. Thank you so much for bringing the world down under to my little computer. It’s my only break from scraping and painting on my little money pit house. I feel totally refreshed now and ready to hit the tile stores. The landscape has such a wildness and beauty, how lucky you are! (Well, you knew that already! :) Enjoy a lovely weekend! Those destinations have been on my ‘must see’ list for a while now, so thanks for sharing it with me so that I can have a tiny taste of what I’m missing. Love the dusty boots and had no idea that dingoes were fisherfolk! Oh, spam attack above. Lovely photos and scenery, as always, but how cheap are people to not pay a couple of dollars for facilities? I think an honesty box might encourage people to pay, or maybe I overestimate people.